The Skookum Award of Excellence was established in 1989 by the Western New England University Alumni Association as a way to recognize the outstanding achievements of students. The Skookum Award recognizes the commitment and dedicated service of Western New England University students throughout their college career by their demonstrated leadership roles on campus, community service/volunteer experiences, and participation in athletics and cocurricular programs. The word Skookum means excellence in the Chinook Indian culture. This annual award process takes place each spring semester to prepare for the Skookum Awards brunch the following fall. On September 23, 2018, Alumni Association Skookum Awards were presented to 15 students who have demonstrated excellence in academics, co-curricular activities, athletics, volunteer work, and community service. (L-R) Bottom row: Alexandra Summa, and Megan Pantos. Middle row: London Green, Caitlyn Marchand, James Sullivan, Vice President for Advancement Beverly Dwight, Daniel Paradiso, Melissa Montalvo, and Joseph Strid. Top row: Michael Ciofalo, Matthew Koslowski, Kenneth Stratton, D'Naysia Stonick, Brendan Kaljulaid, Patrick Tierney and Alexander Fletcher. Read full biographies of the award recipients. On October 15, 2017, Alumni Association Skookum Awards were presented to 15 students who have demonstrated excellence in academics, co-curricular activities, athletics, volunteer work, and community service. (L-R) Bottom row: Nilsa Salas (Forensic Chemistry), Kristina Altomonte (Health Services), Chas Figueroa (Sociology), Kathryn Jordan (Biomedical Engineering), Lexi-Amber Hassell (Neuroscience), and Gina Lanzano (Creative Writing). Middle row: Rachel Bolduc (Criminal Justice), Michael Spagnolo (Accounting and Finance), Tiffany-Rae Robinson (Biomedical Engineering), Iman Shehemi (Accounting and Finance), Ryan Brault (Business Analytics and Information Management and Finance), Hayley Johnson (Psychology), and Alexis McCrae (Criminal Justice). Top row: Michael Veronesi (Biomedical Engineering), President Anthony S. Caprio, and Tucker France IV (Accounting and Finance). The 2016 Skookum Award recipients: (L-R) Bottom row: Matthew Simmons, Morgan DiBacco, Kayla Chapaloinis, Allissa Long, Fredericke Rizos, and David Briganti. 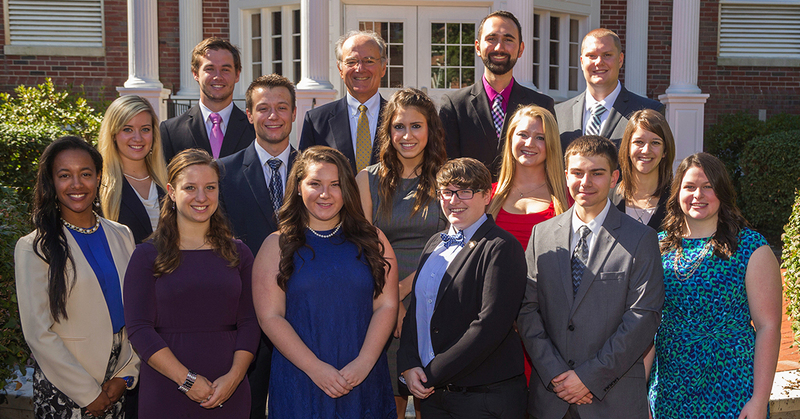 Top row: Chris Jurkiewicz, Sara Holland, Kelly Clancy, President Anthony S. Caprio, Patrick O’Brien, Joeanna Glantz, Samantha DiGiovanni, Danielle Chylinski, and Erin Carroll. Read the full biographies of the award winners. The 2015 Skookum Award recipients: (L-R) bottom row: Alexandria Dean, Jessica Barnet, Gretchen Pancak, Hailey Greenhalgh, Timothy Rapszynski, and Melissa Ferris. Top row: Andres Otero, President Anthony S. Caprio, Alexander DeFelice, and Matthew LaCoille. Not pictured: Bobby Caruso. Read about the award recipients.